As a Buyer you want to know that a home is safe, structurally and mechanically sound and free of health risks. You want as much information as possible about the home you are considering for purchase and a comprehensive home inspection offers important protection for your investment. Your WELCOME HOME Inspector will conduct a comprehensive visual inspection inside and out. Your detailed Home Inspection Report will provide a solid foundation of knowledge about the home, its components and systems. In addition your home inspector will include maintenance tips and other information to protect your investment. A WELCOME HOME inspection helps eliminate unwelcome surprises and protects your peace of mind. As a Seller you want to know potential problems up front to correct obstacles before listing your home. This quickens the sale process and virtually eliminates the stress of last minute delays and costly renegotiating. Your WELCOME HOME inspector will conduct a comprehensive visual inspection inside and out. Your detailed Home Inspection Report will help identify deficiencies that may need to be addressed prior to listing your home. It will also include recommendations for repairs that may enhance the marketability of your home. A WELCOME HOME inspection can help sell your home faster at the highest possible price. A pre-sale inspection is a valuable marketing tool to set your home apart. Under this program detailed forms and checklists are required to be submitted to Tarion. Welcome Home Inspections offers the following services for new home owners who need to provide their builders with a deficiency list that should be repaired before the warranty periods expires. 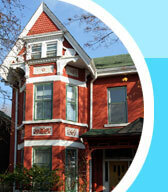 Welcome Home Inspection Services will provide you with a report detailing the deficiencies complete with photographs. After you have lived in your new home for a period of time some defects may show up that were not apparent at the your Pre Delivery Inspection. It is the responsibility of the new home owner to submit a list of deficiencies to Tarion within the 30 days prior to the 30 day and one year anniversary. Any claims related to defects covered by these warranties may not be accepted if they are filed after the due date. These inspections are your opportunity to have the builder correct or repair any problems with the major systems in your home. This includes electrical, plumbing, heating, cooling and ventilation systems. Water penetration into the basement, exterior cladding and structural defects are also included. 30 day - Your Welcome Home inspector will conduct a comprehensive inspection inside and out. Following the inspection, you will be presented with your detailed Home Inspection Report which will provide a solid foundation of knowledge about the home, its systems and components as well as maintenance tips and other information to protect your investment. In addition he will assist you with completion of the Tarion forms. One year – Your inspector will conduct a comprehensive inspection inside and out including results of any repairs completed since the 30 day Tarion form was submitted. He will provide a written Home Inspection Report to cover outstanding items or new problems. He will also assist you with completion of the Tarion forms.